The reason that artists put their work on the street is so that it can be enjoyed by everyone. Not made for those who frequent museums or galleries it often contains a political or area specific message. 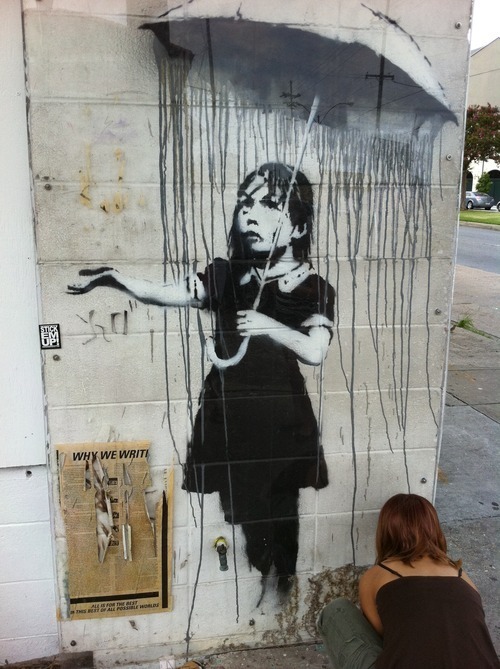 The notoriously secretive and increasingly popular British artist, Banksy visited New Orleans in 2008, 3 years after the Katrina disaster took place there. His goal for the visit was to give something back to the people who were so poorly cared for after the disaster. He painted several pieces around the city, mostly in blighted areas and many have been slowly painted over, destroyed or been demolished with the buildings that the paintings existed on. Umbrella Girl is special because it is on a corner near a particularly dangerous park at the end of the French Quarter. It’s painted on a cinder block wall directly across the street from a small convenience store. I have seen it multiple times since it was painted in 2008 and over the years there have been many things placed around it, in a kind of tribute to the piece, the piece itself has remained untouched. There is a piece of plexi-glass protecting the painting and there is almost always someone admiring and photographing the piece. 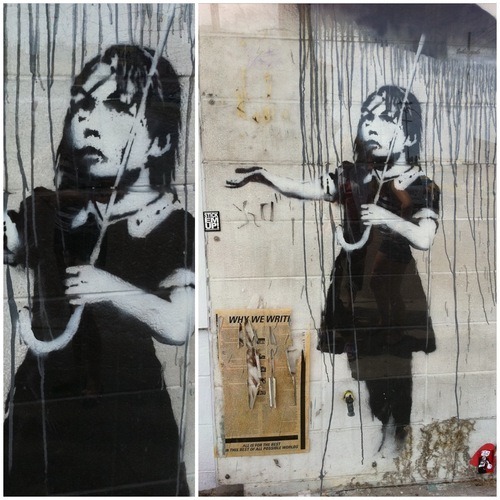 The story is that this guy, knowing that Banksy’s are selling for thousands of dollars and not caring at all what this piece means to the community or the people who come from all over to see it – decided that he would take it. It’s on the street- can you say, theft? Stealing from the poor? REALLY?! The man first attempted to jack hammer the piece away in broad daylight with no cover. He was confronted by many locals asking why he was there and he lied and said that he was taking the piece for an exhibit in London at the Tate Modern. He left for awhile and constructed a wooden barrier and continued to attempt to steal the piece from behind the barrier. People continued to confront him, the police were called and eventually he disappeared, uncaught. It’t highly unlikely that the piece will survive much longer at this point. It was severely damaged from the fracturing of the rock above it. Hopefully with his picture out there for the world to see he will be ostracized for his greedy actions. That art belongs to the people of New Orleans. It was a gift. It is not to be sold or owned by anyone else.